Picture this situation: you’re an author on a popular blog that’s published by several users; you’re wondering which author is getting the most views… Well now you can find out. Today we’re introducing a new panel to your stats page, Top Authors. Here’s how it works: all the posts that were visited during the day are counted up, divided by who wrote them. The author with the most visits across all his or her posts of the day, gets the top spot. Interestingly, the top spot is not about who wrote the most posts, it’s about which author wrote the posts that got the most visits. To see each author’s posts, you can click the little plus icon to expand and reveal just what stories earned them their points of the day. Pictured above, the wonderful Jane Wells had just posted about the exciting new WordPress 3.1 features. Because that was a popular post, it earned her the top spot. At this blog here, we don’t actively compete for the top spot (or do we!? ), but other blogs might find these statistics mighty fascinating. Because we liked the grouping feature so much, we also added it to your referrers box, which now bundles up links from the same domain. The new panel is available for all blogs on WordPress.com. It will appear automatically if you have two or more authors with traffic on their posts. In the not-so-distant future, “Top Authors” along with the new look for stats, will be available for self-hosted blogs running the Stats plugin. Ooooh, great addition, WordPress! Thanks a lot! This is excellent. Well done again WordPress team. This is wonderful! It will be particularly useful because of the way it has been implemented (e.g., “…wrote the most posts, it’s about which author wrote the posts that got the most visits). WordPress continues to be the very best blogging tool out there! But, it’s seems like a new open door to competition. awesome! why not also make a widget of a similar format? That’s not a bad idea. For now, though, it’ll remain within the confines of your stats page! > It will appear automatically if you have two or more authors with traffic on their posts. > In the not-so-distant future, “Top Authors” along with the new look for stats, will be available for self-hosted blogs running the Stats plugin. Not bad WP! Not bad at all! How come I get it when I am the only one posting on my blog? That’s a good question! We’ll debug this and post a fix soon. Thanks very much for the report. We deployed a fix just a minute ago. The author with the most visits across all his or her posts of the day, gets the top spot? This has almost nothing to do with the author. Mostly this number depends on the subject. I would select “Top author” by the highest number of subscriptions! and that’s with no one commenting! It’s all a matter of what really concerns you – the numbers or the quality! Great idea. But it’s turning to a competition…sort of. Honestly, this is not somethlng I really want to view. The top author when I’m down on the bottom! No thanks. Remember, the most visited posts aren’t necessarily the best written posts. In my experience, there’s a lot of luck involved in writing a popular post. That said, you can hide the box if you really don’t want to see it. 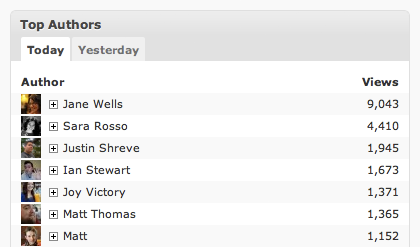 Click the little tab in the top right corner of your stats page, “screen options”, and uncheck the Top Authors checkbox. I can not see who won yesterday, but today is Jane. Hm… I was looking for this feature and thought I was a dummy ’cause I couldn’t find it. I guess I just assumed it was always a competition. So silly of me! Here is a suggestion – the various flavors of Google (google.com, google.co.in, google.it, google.ca, google.es, google.ie, google.com.vn, google.ae, google.ps, etc, etc, etc)… could they be seen by the stats as the “same domain” for the purposes of the referrers box? We will be polishing the grouping of referrers. This type of grouping may be part of a future update. What a good idea! Obviously helps to encourage more vicious blogging! If your blog only has only one editor, you won’t see the new panel. That’s fantastic! Will you apply the grouping to historical data (i.e., weekly, monthly referrer stats)? Doing so would be helpful, showing totals from the search engines and major sites. We are looking at expanding the polish done to the referrers box, but things are still in flux. Love the grouping of the referrers, thanks! Top authors doesn’t count for me though since I run my blog solo, but good to know. i wanna be on top!!! haha…. It’s nice to know how they got there but I’m not competing against anyone but myself when it comes to my blog. I have a passion for writing and for lots of subjects. If I get 300 hits a day I’m happy. I don’t link to anyone and I only comment on a few sites. I think if thousands were beating a path to my blog I’d be overwhelmed and feel pressured in some way. I just like blogging along at my pace. It seems like a good tool though. I’m really curious about knowing who gets the most views, great idea! Great idea! But is does not mean that the most visits make it the best read. It will give a boost to those in the top ten. Hmm, International language blogs only. Interesting but not complete. It is a great idea, though, sadly, I do not to be on the list anytime soon. I should be clear: this is not a global list. This is a list that is unique to every multi-user WordPress.com blog. In fact, unless your blog is a multi-user blog, you won’t see this panel at all. That’s lovely ^^ I don’t have a multi-user blog though. I really like these new features, especially the grouping for the referrers, but is there any way to keep the grouping once you go from the overall stats page to the page looking at all the referrers? We have no current plans to expand on the top authors feature. i have a long way to go with only 2 views, and one of those was my mom. Will there be an “all-time” tab added to this new panel? It’d be interesting to see how many hits we were getting before this panel was added. Is there a way to add it that it can look back through your site history and calculate it that way? Or is it due for an update at a later stage? Currently, we have no plans to add an “all-time” tab, but this may be something we’ll add in the future. It’s a good idea. This could come in handy – and I’m sure it’s expanding the boundaries for other blogs as well. Big thumbs up … thanks for this wonderful new feature! Oo, how exciting. Of course, as I am the only one who writes for my blog, I win all the time! Question: I am only a few months into blogging and I am learning via the school of hard knocks. How is it possible to be ” an author on a popular blog that’s published by several users?” Does this mean that others pick up your blog and republish? A great idea to cherish. Thanks a lot and regards to ALL wordpress bloggers. More power and may god bless us all. is there other “top” categories? Like the most active blogger (who post most posts). If not that would be a really good idea. Many other blogg sites has it. Why is it only ever a measure of quantity? I understand that quantity is the easiest thing to be measured, but I sometimes wish that there would be a “top post” based on quality of writing. It would be so nice if there was a WordPress service where critics or readers rate the best reads on a daily basis (even if it is from a randomly selected sample of blogs). I am always struggling to find a good story. This is why I love the blogs that show the most daily growth – there is often something good in them. While each person’s preference and taste differ, there is some universality which can compare one story to another. In a way that is similar to “most highly rated” on YouTube, WordPress should implement something that allows users to recommend the most well-written and interesting posts for the wandering reader. This is just a soft request – perhaps create a “recommend to a friend” system where the most shared posts are rated and recommended. It is only a measure of quantity in the way that we are counting visits. It is not about who wrote the most posts. It is also an optional statistic. If you don’t like it, you can disable it using the little “Screen Options” tab in the top right corner. As for measuring quality, that is difficult — we have to work with human metrics. Visits to a post is a human metric, comments to a post is a metric, and so is social shares and likes. These are all things we may explore in future statistics revisions. Kinda interesting. This will definitely make blogging more competitive, especially between poets on community blogs. It’s awkward. On my multi user blog, I’m the most prolific and also seem to be the “top author”. As much as WordPress has evolved over the past few years, I am excited to think how it will continue to improve in the future. Thank you WordPress for being totally awesome. You are free to ignore this statistic if you find it useless. You can hide it by unchecking the box in the little “Screen Options” tab in the top right corner. Like “Top Posts” is meant to provide a means to see which content got the most attention on your blog, so “Top Authors” is meant to provide a means to see which author managed to — through effort or accident — gather the most visits. As a statistic, we find it will be valuable to some. awesome! now all my contributors can see just how much attention they are getting. Wait a sec…i have no contributors…damn. i’m new to wordpress but TopAuthor is a fantastic welcome. wordpress has gotten me excited. i need my new editors pronto! Are there plans to add historical data as well? It would be neat to see the all time most popular authors. Very cool. This will definately be me on 50% of the blogs that I am on. Amazing idea! I bet there will be a lot of competiton with the authors! I like this idea! Just so everyone, no matter who each and everybody is, would be connected in a way…. Nice idea…. keep the the updates coming! i have two authors in my blog but can’t see this feature? isn’t it up yet? The feature is up and running. It will only show up if you have more than one author that has written posts. If you have an author that hasn’t written any posts, the box will not show up. I have a website, but my readers wanted to be able to leave comments, so a blog was the easiest route. I am pleasantly surprised at the quality of WordPress, it is feature rich, and that is the FREE side. You folks ROCK ! I get more stats and ease of thingys here than my webhost ! Thanks Joen. I look forward to the future human/qualitative stats. Nice feature! Will be handy if I ever have any other writers come on board! Ha! What’s an average hits per good post per day? any bench marks ? I am averaging 100 hits, is this good or average? This is interesting to me because I recently had one posting that I wrote that went through the roof one day. It wasn’t that I had written something so unusual, but that I had mentioned a site that was about how to find out about celebrities’ net worth. Daniel Tosh of Comedy Central mentioned that same site one day and sent my stats out the roof. I’ll be curious to keep an eye on how this rating system works. Thanks for the update. That really is a superb idea! I’ve only been with WordPress for a couple of months now after migrating from Windows Live Spaces, but so far I have enjoyed my experience with WordPress. I think there will be benchmark, and i am sure its over 100 hits. You will be count as top author among all wordpress users bloggers. Anyways, go visit my blog! Your new stats page is fantastic… top, top effort guys. Just joined WordPress for less than a week. Definitely aiming to be in the Top Authors league in time to come.